COLOR!!! Isn't it so wonderful to look at?! I could sit around and do these color studies all day...which is slightly productive, but there's many more pressing things that I should be getting done, so I can't do them all day/every day. Unfortunately. But, this sort of thing is perfect for understanding how certain colors mix together, color theory, tones vs. hues, etc. So, let me explain the method to this madness, so you can do it yourself! First, pick out the color or colors that you want to focus on. For this particular study, I wanted to study the color Lemon Yellow Deep by Winsor & Newton specifically. When I'm painting with watercolor, I only use Winsor & Newton, and LYD is my go to yellow. Love it. So, I'll start with a pencil map. You'll see a great range in colors and tones (dark vs. light) if you map out an area of 3 boxes by 5 boxes for each combination. Sometimes I do 3x6, but for your first, start out with 3x5. Here, I've done each box at .75"x.75" with a margin of .5" between each combination. So, at the very top I have a row of just LYD. Between each square, I add water to my brush to lighten each time (3 across). The top combination is LYD with Opera Rose (OR). Once you add your pure LYD boxes at the top, lightening between the first, second and third, you will count down to the fifth box and do the same thing with just OR. From there, you will add a couple dashes of LYD to the pure OR mixture on your palette, and move up to the fourth row. Apply three across, getting lighter between each box. Add a little more yellow and do the same thing for the third row. More yellow, and repeat for the second row. Now you have your first combination! Because I was focusing on LYD, each top row for every combination was LYD with the bottom rows being a different color from Winsor & Newton. Use the .5" margins between the combinations to label which colors you used so you don't forget! Try every combination! Even if you don't think certain colors would mix well together, you may be pleasantly surprised! I like to do about 20-25 combinations on a sheet of watercolor paper roughly 22"x30" in size, but feel free to go however small or large. Once the color study is complete, I like to go in and label certain swatches/boxes with titles like: skin tone light, skin tone medium, or eucalyptus, sand color, etc...It helps you remember how to mix up certain tones for future paintings and projects! So, have fun! These studies are great educators and also a fun, colorful piece you can hang in your home! Let’s get real you guys, we all struggle with comparison. It eats away at us and ruins the authenticity of why we do what we do. Whether we’re artists, photographers, make up artists, moms, wives, husbands, fashion bloggers...you name it, we all face it! The accessibility we have to other amazing artists, photographers, etc., through social media can either make it worse, or make us strive to be better. Someone who strives for excellence rather than perfection is a person who can be satisfied and focused on the process rather than the outcome of whatever it is they do. But it’s hard to focus on the process when we’re constantly checking for how many likes and who’s working this or that job, and thinking it should be you doing this or that instead of them. Comparison is real and it is very prevalent today, and it can destroy a person’s psyche and a person’s business. I’ve been there. Small businesses are popping up like weeds today, and I’ve been scrolling through my feed and seeing people I follow taking vacations, starting a family, working with that photographer in that country and eating that food...how do I get *that*? And as an artist, the battle of comparing yourself to other artists can take over your thought life and can become debilitating. This isn’t a new trend either, this also happened to magnificent painters and artists like Gougin, Van Gogh, Georgia O’Keefe, etc., who either suffered from a nervous breakdown because of the pressure and reality of failure, or depression, or just plain insanity (ehem, looking at you Van Gogh). And they didn’t even have Instagram!! Think about how easy it is now to look through another artist’s work or see how many weddings that photographer is booking in those exotic countries just by turning on your phone! *Side note: I’m not in anyway saying I’m suffering from insanity because of being a small business owner, but just to be dramatic I thought I’d bring out those big guns. * But, the struggle is real and it can take over every part of our lives. "Today you are you! That is truer than true! Yes, it’s God’s business. Not ours. We are human, we all make mistakes...even that person you idolize via social media, they make mistakes too. So, go out there and enjoy the process of whatever it is you do. Strive for excellence, be human and be you. If you missed the other parts of this series on work/life balance, you can find the here: 1, 2, 3, 4. "Why is it so expensive?" I use Kolinsky Series 7 Red Sable brushes. These are made in England by Winsor & Newton and take the best craftsmen they have as each brush is fashioned by hand using the dexterity and skill born after 7 years of experience by each craftsman. Sable hair is by far the best type of hair for watercolor. Other types of hair can be camel, squirrel, mixed hair, synthetic, etc. and will produce poor results in comparison to sable. The result is the finest watercolor brushes you can purchase, undeniably expensive—uncompromisingly made in the Royal tradition. Each Series 7 watercolor brush features only the finest Kolinsky Red Sable hair mounted within seamless cupro-nickel ferrules attached to balanced black Italian Albata, polished wood handles. All Series 7 brushes hold color with supreme precision. The sizes that I tend to use most are a round tip size 6 ($135) and a round tip size 14 ($1,300). Yes, you read those prices right. Once you get up to size 8 and above, the prices can jump tremendously! Round tip brushes are great 2-in-1 brushes. You can point them straight down and use just the thin tip, or flatten them on their side for a wider stroke. Their flexibility between stroke widths is what makes them so fun to use. It's like bouncing and floating in water. This is why having sable hair is crucial. These brushes need to hold their form, and go back and forth between a thin tip and a wide belly very easily. Cheaper hair brushes will not be able to do this. Along with this, more inexpensive brushes won't hold pigment very well. When they are wet they can flop over like a wet mop - it's very frustrating. They completely loose their integrity almost immediately. Releasing pigment onto paper is more of struggle with these brushes than having a stronger and sturdier brush. It makes all the difference with the outcome of your painting. I use Fabriano Artistico Extra White Watercolor Cold Pressed 100% Cotton 300gsm paper (phew! that was a lot!). The cost of 5 sheets of 16x20 paper is $26! That is $5.20 per piece of paper. This paper is the purest bright white available without the use of optical brighteners or bleaches. It is mould-made of 100% cotton and is acid-free/pH neutral and chlorine-free. Because of the benefits listed, the color will last longer on the paper, it won't bleed and it will hold the pigment in place with it's toothy texture. With a smoother more inexpensive paper, the colors will fade faster over time and your watercolor will bleed because the paint will not stay in place. This can completely change your results! I use Winsor and Newton Professional Watercolor paint. This paint is known to be the purest of pigments and is known for it's brilliance, permanence and strength of color. Prices go up to $13.69 per 14ml tube, which is about the same size as your traditional nail polish bottle. Some pigments are more expensive and much harder to find. These paints also have the AP seal of the Art & Creative Materials Institute, Inc. (ACMI) and are certified non-toxic. Where you find lower quality, less expensive paint is when manufacturers substitute expensive pigments for synthetic ingredients. Not only are they more harmful to your health, they can also lack vibrancy and permanence. If you see the word 'hue' after the name of the pigment, you will know that it is a substitute for the real thing! Although there are tons of supplies for every artist for student, professional, and in-between, this post may answer a few questions to why professional grade paints, brushes, and paper can seem pricey. The above 3 elements can make ALL the difference in the outcome of your paintings! Your results will always vary depending on brand, quality and performance. If you are serious about becoming an artist these standards apply to all types of artwork. Whether you prefer oil, acrylic or watercolor, going for the cheap stuff will give you cheap results! Technology is a beautiful thing. We’re able to run our businesses from our fingertips, check in with our clients and find inspiration for projects with just a couple clicks. But with that, it has also made our accessibility almost unlimited. Our job never stops. I’ve found myself waking up in the middle of the night to check an email or to write something down for a project on my phone. The instant connection we have with our inbox, social media platforms and more, creates a disconnect with our most important relationships and human interactions. Let’s be real you guys, we all check our Instagram way too often, and I know there’s times we are with our significant other or a friend, scrolling through articles, or facebook, or emails. What’s up with that? When we disconnect from our lives to connect to our devices, we increase stress and place higher value on our work than our friendships, marriages and life experiences. When you’re at a friends house or on a date with your significant other, don’t check those emails. The more genuine quality time you’re able to create for yourself is what instills resilience in your life. You’re able to turn it off, unplug, and work hard when you get back to the office. You have the self-control to turn off notifications while you’re out, not check that post, and not scroll through that article. This will make you a better friend, wife/husband, and a better business person. With how easy it is to check in on a project or write a couple emails, we have become crippled with bad discipline and lacking skills in interaction and vulnerability. The foundations of our businesses need to be built with self-control and discipline. For me, unplugging is incredibly difficult. I’m sure this is true of everyone who is an entrepreneur, service provider, freelancer, etc. There’s demand, things are busy, and clients don’t always follow your business hours. There’s constant problems to be solved and questions to be answered. I’ve found that when I am able to turn it off and not check in, my problem solving and responses to my clients come much easier. I’ve had time with friends and family, God, and time alone and I’m feeling refreshed. So how do YOU implement this? Once my business started ramping up, I set up my business hours. Monday - Thursday 10am to 4pm. I am, most weeks, still working seven days a week, late nights, etc. but I rarely check my emails during off hours and days. I’ve also put up the boundary to never answer any work emails after 7pm. It’s crucial to not let your clients believe you’re accessible at any time. Some responses need time to stew. I want my clients to treat my business like a business. Not getting involved in too much of me as a person, how stressed I am, etc. I think there’s definitely a time and a place to be vulnerable and to show your followers or clients that you are in fact a human, you make mistakes, you have pets, a husband, a house, etc., but immediate accessibility blurs those lines a little too much. I would like to say that I’ve figured out this work/life balance thing, and I don’t work 65+ hours a week, but that’s not the truth. This is a season, you may be in a season, and we have to work ourselves to the bone sometimes. I don’t think that’s wrong. Once I let that affect those who are most important to me and my relationship with God, then it’s time to regroup and redefine boundaries. So, for now, put work aside for a couple hours, go to that dinner, don’t reschedule, meet up for coffee. It’s not going to make your business combust. It will all get done. To be honest, I basically owe my business to Instagram...it’s free advertising! It’s amazing! But it’s time to start putting more value on my/your life and human interactions, and in order to do that, we need to take time to unplug. Draw a circle around your life, your family, your relationships. Don’t let your business and your devices penetrate that circle and overtake you as a person. It’s not going to be easy, but it is going to have such a huge affect on every aspect of your life and business. My studio, La Salle HQ, has a giant 20'x20'x20' white infinity wall, and I felt like it needed some color! Staring into a sea of white can really mess with your brain. So, I got inspired to get a giant canvas and paint it with bright and attractive colors! I wanted to write about how I set up the whole thing, so you could do something like this! It would be perfect for a photo backdrop or to add some punch to a bland room! First, I ordered the canvas. The one I got is 6 feet wide by 18 feet long. HUGE! Because our photo wall is made up of concrete and not something like wood which would handle nails well, I hung the canvas up on a giant rolling rack. This way it's easy for me to roll in and out of the photo wall, if we have a photo shoot going on in here. The canvas holds up with metal shower curtain rings no problem, but if you wanted, you could nail it to a wall or however you want because of how thin it is. Also, the canvas was so long that I was able to cut it in half and hang another blank side on the back with the shower curtain rings. I now have 2 giant canvases to paint on! Now for the important part. 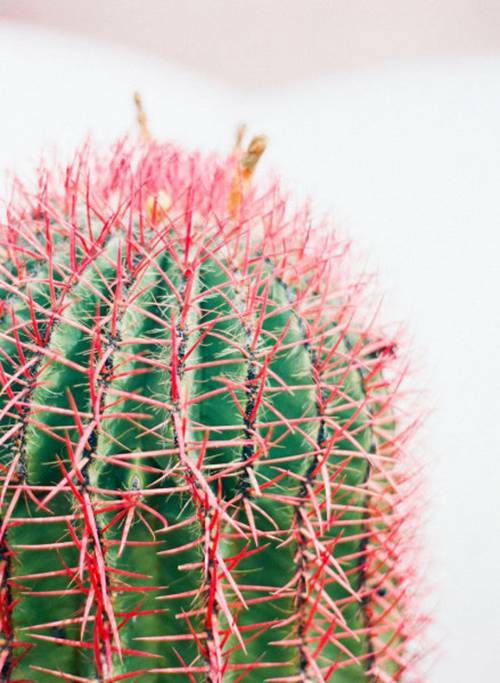 To make a really vibrant and eye-catching piece, you have to buy the right materials and colors that compliment your space well. I used some of my favorite colors, you probably see them gracing my social media or blog quite often: cobalt, chartreuse, white, soft pink, turquoise and indigo. A nice balance of cool colors with a dash of pink. The brand of acrylic that I use is Golden. I use two different types of acrylic paint from them: the fluids and the heavy body. These vary in consistency and appearance. For the thicker paints (heavy body), I use a lot of water on my brush to get more movement with the strokes, and the fluids are much thinner and don't require a lot of water. The brush I used for this was a size 24 flat to get really wide strokes, but you could probably use something larger to cover more area with one stroke. Because the canvas is so large, you'll definitely need a larger brush! When painting this, I wanted a lot of dripping and running to happen with the paint. I also splattered color in areas - just remember to have fun and don't over do it. With painting, it's all about the process and not over-thinking or over-doing it. Remember simpler is always better. Once I start messing with a painting for too long, it always looks worse than if I would've stopped sooner. I hope you try something like this out for yourselves and I can't wait to use this as a backdrop for my workshops at La Salle HQ! Nothing makes my job easier than working with genuinely nice people. Like, the kind of people you just know from the beginning you could go grab a drink with. From the beginning, Anna and her fiancee, Derek, were so encouraging with every piece of artwork I sent over and their love for each other was so radiant that it made it hard to not put in the extra love and care to their pieces! Not only that, but they handpicked an amazing team of vendors to take care of their day, how could I not blog these photos?! Take a look below at some snippets, and make sure to head over to the full feature on Style Me Pretty! Beautiful, right?? Check out the rest of the amazing team below! You don’t have to wear all of the hats! Sure, you own the business, your talent/creations/products are what keep this thing afloat, but, think about what parts of your business don’t have to be run by you. Emails? Inventory/ordering supplies? Writing blogs? Editing photos? etc. What kind of money would you pay to have 15-20 hours of your time back? -Studio upkeep/making sure all things are filed, legal documents are squared away, etc. Once I broke down my business and saw how much time I was spending on tasks that someone else could do just as good, if not better, I began to realize how much time and money I was wasting. Yes, you will be having to pay this person to do these things, but, with that extra 15-20 hours, why not take on an additional project per month and make up for that money, if not more?! Not only will this provide you with extra hours to accomplish more work, but it will give you back some time for a social life, which, we all know is crucial for our sanity. Since hiring my first studio manager back in March, I’ve noticed a huge increase in my productivity and, when I used to spend close to 2 hours a day answering emails, I now barely spend any time in there. And that’s huge. For me, I knew I had to hire someone organized, someone who didn’t need much instruction but could just take charge, and someone who is decisive. Not only has this allowed me to have more time for the tasks I actually enjoy, but I’m able to focus more on each client and give them the full attention their project needs. This makes it easier for me to cut down on revisions and communicate more effectively, because I have more time to spend on their project and to really grasp what each job holds before I put pen to paper. Yes, you will most likely still work late some nights (I just finished working on a project and am writing this post at 12:30am), and you will probably still check your emails while you’re out with friends, but you don’t have to wear all of the hats involved in your small but mighty business. If you do, you will be throwing time out the window. Also, I know when I’m overworked, I never feel like I’m able to be as creative or come up with problem solving ideas for projects. So, because I appreciate a good small business, I want you guys to think about outsourcing. If you’ve been struggling to get everything done and are still working past what’s normal and good, pay someone to give you that extra time back! So, go help boost the economy with your sole-proprietorship, make more spoons, plan more weddings, brand more things, do more of what you love! To be real with you guys, I never had any intentions to start a business. When my husband and I moved from Chicago back to my hometown of San Clemente, California, it was because I was offered a job working for my uncle at his financial planning office. Admin stuff, in a cube, sitting in terrible traffic, etc. I was so thankful for the job and to not be working at a bar in downtown Chicago anymore, but I’ll be honest, that cube life takes a really special person, and I quickly realized that I was not that special person! But, during this time, I would come home everyday and paint. It was like therapy and I was able to turn my brain off after sitting in traffic for over an hour, practicing, drawing and painting for countless hours. Well, fast forward a little bit, I started posting my work on social media, and four months after I started working for my uncle, I had to quit because this “art thing” got so busy. I had no idea what I was doing, what my business even was, if I was going to make enough money... All I knew was that I loved what I was doing and I was too busy to have two full time jobs. Since going full time roughly three years ago now, I’ve learned a lot about having to prioritize your work and life...it was sort of forced upon me just because of how quickly things snowballed. Not only have I learned how to make my to do lists in order of importance, but priorities are all about follow through, and I wouldn’t still be doing what I do without sticking to them. - Design: transfer artwork into custom wedding suites and stationery, branding, etc. - Inventory: Studio upkeep, order workshop supplies, etc. There’s more, but I’ll stop there. For me, artwork is at the top of the list. It’s what got me started, it’s what I’m most passionate about and is my favorite part of my job. So, why would I give this part of my job the short end of the stick? Over the years I’ve failed and made countless mistakes, and the majority of those times is due to the fact that I didn’t allow myself enough time for what I really love. My main focus had shifted to the administrative tasks that, yes, keep my business afloat and are totally necessary, but because being a small business means you call the shots, you complete all the tasks, you do it all, I was overbooked, overwhelmed and stifling my creativity. Don’t do that. Schedule your time according to importance or priorities, keep track of how booked you are, and don't go beyond what you can handle, and you’ll have a more enjoyable workday, I promise, and in the long run make more money because you're creating better (more stress free) work. So, what does this mean? Well, for me, writing emails is definitely not my favorite part of my job. I’ve learned to only answer emails during the period of the day that I know I have the headspace for them. For me, that is first thing in the morning. With multiple projects and deadlines going on at once, I don’t want to have these unanswered emails hanging over my head for the rest of the day while I’m trying to be creative and put together custom artwork and concepts for my clients. Without having a task like emails looming around, I can check that off and feel way more motivated and inspired to clear my head and start painting, drawing or designing. It’s also important to schedule downtime and to keep official business hours. This one is very hard for me, and I rarely stop working at 6pm, but, repeat after me, your personal life IS more important than your working life. The time you spend investing in valuable relationships is one of the best ways to de-stress and I’ve found that I’m think way more clearly when I’ve had some good human to human connection. If I’m running on a week with no human interaction, you can just assume that my face is on a desk somewhere or I'm blankly staring at my computer screen. We need our sanity, so I have listed that our office hours are 10am - 6pm Monday thru Thursday. These days and times are when I will get all of my emailing done, schedule meetings, and, if it’s a good week, all of my work will be done during this time, including artwork and designing! I’ve found that answering emails and questions from clients and such after my listed business hours doesn’t portray professionalism. I also don’t like answering emails past 6pm (unless it’s SUPER urgent) because of how it creeps in on my evenings with John, friends, or even alone time. If I do answer an email past 6pm when I don't need to, it totally takes me out of the headspace of ready to hang, be a good listener, engaging Jenna. It turns my focus back to work when there's plenty of time to do that tomorrow. If it’s not urgent and it’s past the hours that you’ve set for yourself, just don’t answer it! You will then have a fresh outlook and response ready in the morning or sometime the next day when you sit down to answer it! There is an exception to this though, when I am working late and I notice that I have a couple new emails from the evening, I may decide to answer them back. Sometimes when I’m right there and in it, I just know I’ll answer it more properly if I don’t wait. Maybe I’ve been looking through a specific client’s Basecamp schedule/folder and receive an email from them asking about a due date or something, well, since I just looked it up I can tell them. If I wait till the next day, I may forget. BUT, because I feel like it’s important as a place of business to not portray yourself as immediately ready and available at all times to your customers, I use what’s called Boomerang for my Gmail. I’ll write up the response and click “send later,” and schedule the time I’d like for it to send! It’s brilliant! You can schedule follow up emails for inquiries, create canned responses for emails that you receive on the regular...it’s seriously a game changer! I don’t know what I would do without it. So, am I good at keeping my priorities in line? Absolutely not. But, when I do, I've noticed how much it affects my work. I start to get things done quicker, don't have to do so many drafts on projects, and my relationships and sanity are in tacked. I think writing up your tasks and titles that fall within your job, whatever it may be, would be the best place to start for prioritizing your life! What is the favorite aspect of your job? Whatever that is, make more time for that by scheduling your other tasks accordingly. It'll make all the difference. Have an idea for one of our journal entry blogs? Or have a question you'd like answered about art, business, design, etc.? Leave them in the comments below and we'll make it our next topic! Hey guys! Because it's hump day and I want you all to finish out your weeks with a punch, I've decided to kick off a little series of "journal entries" on my blog! These "journal entries" will be anything from business tips and advice to art tips, tricks, etc. I'll literally be taking you through my metaphorical diary and letting you in on my secrets as an entrepreneur and artist. I'm no business major or formally trained designer/illustrator, so most of what I'll be writing you is fully based upon my own experience and speculation. Nothing is backed up with research, because ain't nobody got time for that, and it'll mostly be what I would say to myself if I could go back in time. I can't do that, so instead, I'll tell you! Even if "you" is just my mom and like one other person. Journals aren't meant to be shared with anyone anyways, so hereeee we go!!! In the past 3 years of owning my small business I’ve spent most weeks working 70+ hours, waking up with only a couple hours of sleep and anxiously scrambling to get projects put together. You can only do that for so long before you either go insane, or your business AND your personal life suffer. I still find myself over worked often times, and that’s just what comes with most start ups and small businesses - where bigger companies have the luxury and the payroll to afford whole departments to handle their bookkeeping and financial decisions, the administrative tasks, the studio/office upkeep, etc. we small business owners find ourselves shuffling through income/expense reports with our jaws to the floor and our heads spinning because THERE’S JUST SO MUCH TO DO IN SO LITTLE TIME! Well, I’m going to tell you how in this past year or so I’ve been able to manage my time better and therefore, work less. FIRST, learn to love the to do list. About 9 months ago, I started using teuxdeux.com for writing out my daily tasks and I haven’t gone back to paper since. I think one of the biggest problems I had with writing to do lists was the fact that they were on paper! Paper gets lost, it’s not as accessible and it’s clutter. I hate clutter. So, with teuxdeux (great name, right?! ), I’ve transformed into a list making machine, and it’s only $24 a year! With this wonderful app, you’re able to see into future days and create lists, cross off and edit tasks as you go, AND if you don’t cross something off for that day, it’ll automatically move to the next day so you don’t forget! I have the phone app for it, so I’m able to check up on what I have to do while I’m out and about at meetings or away from the studio. Also, before I throw in the towel everyday, I make sure to have an up to date list for all of tomorrow’s tasks, that way the next morning I can look over everything and prioritize my day accordingly. As a highly visual person, it’s so helpful for me to look at the entire day and what’s pressing, instead of just winging it. Don’t waste your time digging through email threads to look for due dates, write it down immediately in your to do list and list things according to importance of when they are due. This will save you so much time - and we all know *time is money*. No, really, really, super valuable. So, get paid for it! Every email you write, every extra minute you’re on the phone, the time it takes you to order supplies/office materials/etc., are all little investments into your business. Let me ask you something, at the end of the day, would you rather have a business that’s been built by an over-worked, under-paid and apathetic operator? Or, someone who is being paid and appreciated for what they’re worth and has their work and life nicely dialed in? Don’t get me wrong, I am FAR from perfect at this and definitely still find myself shedding frustration tears (just an analogy, I don’t really cry that much ;)) wishing I would’ve turned down that job that I just don’t have time for (even though it’s good $$$), and wondering when I’m going to feel like I’m actually on top of my finances. Ugh. But, once I started putting value on my time, it became much easier to say no and made my work days more enjoyable! You need to be your best self, creating your best work, responding to your customers in the best way at all times. And to do that, you have to manage and value your time better. If not, you’ll find yourself falling behind with client communication, stuck in a creative rut, or ignoring your very valuable relationships with friends and family to make up for how behind you always are. Maybe you're reading this and you have a creative business of your own and you’re asking yourself, “well, how do I get paid for all that time spent on the ‘extra stuff’?” Well, my friends, I will be answering that question in a blog post in the very near future, but for now, create a spreadsheet that tracks your hours. I break mine up into broad categories with more descriptives underneath like, “EMAIL: current client communication,” with a list of all my current clients and how much time I spend with each of them providing education, research and anything reflecting their specific project. Another category I have is for potential clients, and how much time is spent putting together estimates, talking over the phone about their needs, writing up an agreement, sending invoices, etc. 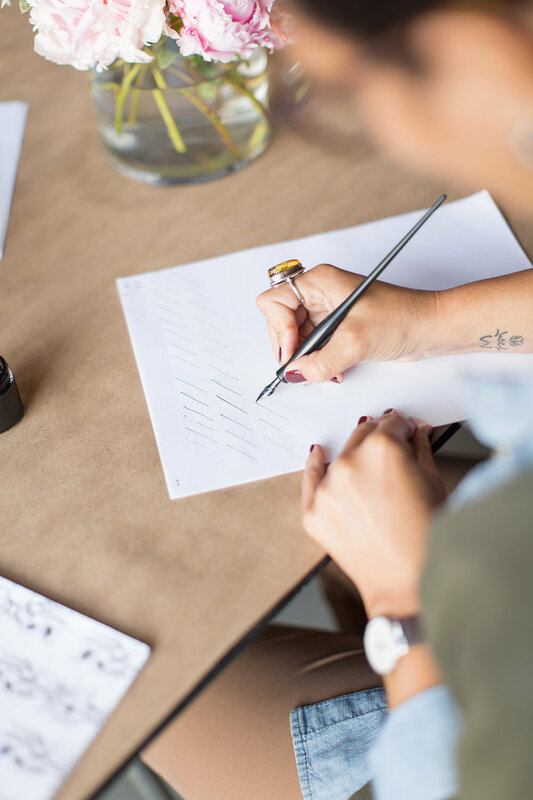 Whether you’re a stationer, jewelry designer, photographer, whatever your job title is under the umbrella of small business owner, time tracking is crucial and helpful in putting value on how you spend your work day. But, I’ll go into more detail on that in another blog soon. treat client communication like it’s freaking gold. With what I do as an artist and designer, mainly with custom stationery, there are a lot of questions along the way from my clients. What types of printing method(s) would work best for their color palette, artwork or budget, ink and paper options and samples, specific artwork requirements, etc. and there are many unknowns for most of my customers when it comes to those things. They don’t design stationery - that’s why they’re coming to me! So, if you own your own service based company, beat your customers to the punch. While you’re already emailing them about finishing up a design for them, jump ahead and let them know about the next stages in the project timeline while you’re at it! My favorite reminder for this sort of thing is Basecamp. I have all of my projects organized in my Basecamp profile and I set up to do lists for both myself as the designer and my clients, so we both know what’s ahead and receive reminders about upcoming tasks. If you are one step, or multiple steps, ahead of the customer, you will save so much time by avoiding emails where they’re following up with you or have a question about one thing or another. So do it. I was going to put all 5 tips in one blog post, but seeing as my first one was so lengthy, for your sake I am breaking them up ;). You’re welcome. If you’re just starting out, or you’ve been at it for awhile and can’t seem to find your stride, I hope these tips are helpful! So, make those to do (or teuxdeux) lists, value your time, and communicate like it’s saving you time. Because it is. Stay tuned for the next four steps on the blog soon! I have the absolute pleasure of taking over one of my most favorite company's Instagram accounts today, Brit + Co! They are an amazing online website that enables the creative community to do their own DIY projects, take online classes and they provide an online store where you can get goodies to make your life more colorful! I was recently asked to host an online class for them featuring my Floral Watercoloring, and it was such an amazing experience! I highly suggest clicking HERE to read more about how you can take my class within the comfort of your own home! We had a very successful and eventful August! From workshops, to travel, photo shoots and more! I started the month off with my FIVE year wedding anniversary to my husband, John! We spent the weekend at The Line hotel in LA. We relaxed by the pool, had Negroni's and ate our way through the weekend. It was perfect quality time spent with my man. La Salle HQ had it's first ever photo shoot from Beyond Meat! Sharkpig Productions came in and filmed an ad with olympic athlete April Ross. It was a super exciting day, at one point we had 35 people in there! Next up were the first ever workshops at La Salle HQ in Costa Mesa! Let me tell you, that space is perfect for workshops! Full house for Modern Calligraphy and Floral Watercoloring. Beautiful centerpieces and florals provided by my lovely mother, Jill Fawcett, doughnuts from Sidecar and eager and excited students ready to fulfill their creativity! THEN Beyond Meat came back for more! This time with pro surfer girl Tia Blanco! We expect to be working with them quite a bit in the future which is awesome because we love them! I then took a trip to San Francisco with my girl Jessica and it was the most fun EVER! I hosted a Floral Watercoloring workshop with Fullosophie I just love working with them! San Francisco was such an adventure, I can't to go back again for more workshops! After getting back from San Francisco I decided it was time for a change. My Instagram used to be @monvoircalligraphy, now it is @monvoirco! Quick, simple and to the point! Make sure to tag #monvoir and #monvoirworkshops if you ever come to a class! Last week I heard the exciting news that you can now buy my Intro to Floral Watercoloring Online Class at Brit+Co's Shop page! You can also read my interview with Creative Director, Anjelika Temple, on the website! What a GREAT month! More awesome things coming in September, stay tuned! I am so excited to announce my partnership with Brit+Co as we launch my online Floral Watercolor class today, Friday August 28th 2015! In this class I will walk you through the tools and techniques I use to create lovely watercolor florals. So, are you ready to take on a new creative hobby?! Click HERE to sign up! As a thank you to our incredible followers, we are going to be running an Instagram giveaway! What will you win? A one of a kind, 9"x12", abstract watercolor piece on paper! We will announce the winner on Friday, August 21st! 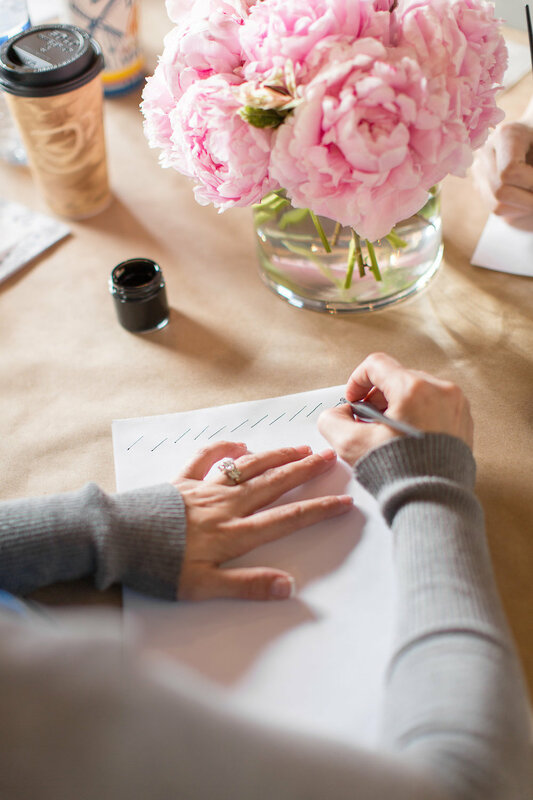 I have been in love with watercolor and calligraphy for as long as I can remember, but what I love more is seeing the smiling faces of those in my workshops witnessing their art come to life! I have taught endless workshops, yet I still find something new in every class I teach. I can't wait to see La Salle's studio packed with creative and eager students! I have two classes coming up on August 22nd at La Salle HQ in Costa Mesa, CA. It is such a fun way to get together with friends, family or come to meet likeminded individuals that want to get creative! Head to our shop to sign up! Lately I've seen a few creatives publish "Ask Me Anything" posts, and I think it's a really nice way to connect with you guys! So... is there anything you'd like to know? Please leave your questions in the comments and I'll do my best to answer as many of them as I can. I'm hoping an informal Q&A might help me to know more of what you are interested in, plus it'll be fun! And in the spirit of asking, I have a question for you: What's your favorite flower? I'm planning on compiling your answers into another post... so please share! Feel free to leave your answer in the comments, along with a question back if you have one. Looking forward to reading your questions and answers! Mon Voir Is ... Moving!!! For those of you who haven't heard the big news yet, Mon Voir is moving! We've been on the hunt for a new studio space for months now and just about a month ago the perfect space opened up. Chloe and Octave, owners of Costa Makers, a co-working space in Costa Mesa announced that they were packing up and heading north. They were looking for someone to immediately take over their live/work space — and for a number of reasons Mon Voir was the right fit. We couldn't be more excited! Not only is the workspace big enough for our growing studio (and team! ), but there's a separate workspace and an amazing photo studio that's ripe for play and work. You better believe I've been pinning new items and projects for the studio like mad! Over the next week or so, we're moving into the space and will be sure to update on Instagram as we do. Watch this space for a tour of the new space and in the meantime, enjoy these dreamy photos courtesy of Costa Makers. A couple of weeks ago, I travelled up to Medford, Oregon for a day of workshops at EdenVale Winery with Betsy Blue Photography. Southern Oregon is so beautiful. I've only been to Oregon before with my family when I was really young, so I didn't really know what to expect. Medford is so gorgeous though. It's all rolling hills and green — lots and lots of green. And in between the hills and the green are dreamy wineries. Betsy was an amazing hostess (I was lucky enough to stay with her and her family for the weekend at their home), and she really went above and beyond to host me and this workshop. Betsy and her family were more than generous with their time and home. They live on a beautiful farm. I got to see baby chicks and wildflowers galore. Because I've been so busy and on the move, the time I had staying there was very inspiring. It was great to slow down and see a family truly focus on each other and the time they invest in their home and life. Thank you, Betsy and family for being such generous and wonderful hosts. So, onto the actual workshop... It, too, was gorgeous. Both the morning modern calligraphy class and the afternoon watercolor class took place in a historic barn at EdenVale. The space had been outfitted with the help of Allure with Decor and Betsy had arranged wonderful sweets and snacks from Mon Chou. Each student was so eager to learn and I loved their friendly and warm demeanors. Everybody was so nice and excited to try a new craft. I love curious and engaged students like these! Between the two classes, students enjoyed lunch, wine and a gorgeous backdrop just outside the barn. Peonies picked from her mother's garden and other florals were arranged by Penny and Lulu Studio Florist. Having such beautiful flowers right in front of us really made the afternoon watercolor class that much more inspired. A big thank you to Betsy for putting together such a fantastic day, and to all of the lovely students — I sincerely enjoyed spending the day with you. To see more photos from the class, visit Betsy's blog here. 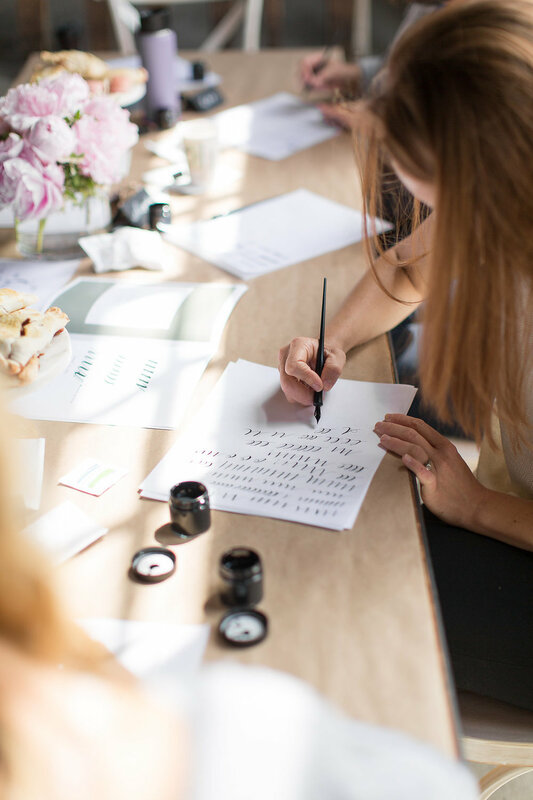 Last month, I headed north to Santa Barbara to teach two calligraphy workshops with the lovely Flutter Magazine at Studio 110 SB. As you can see, Lavender & Twine captured the day beautifully. Read more about the workshops on Flutter Mag's blog here and sign up for upcoming Mon Voir workshops, here. Enjoy these lovely photos featuring beautiful styling by Jill & Co, and flowers by Florabundance. Check out those donuts! We also were lucky to start the day with champagne and flowers. Studio 110 SB was a beautiful and airy space — perfect for a Mon Voir workshop! A nice surprise detail was the gold Chiavari chairs from Classic Party Rentals. To see more photos of the workshop, hop on over to Flutter Mag.